It's been a n 'appy time (yuck-yuck 😉 and I've learned a lot over the last couple of weeks – and had fun doing it! 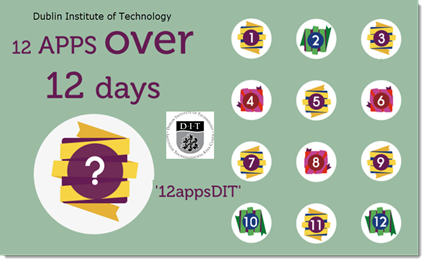 Thanks to the energetic, thoughtful teams at the Dublin Institute of Technology (#12appsDIT), Regents University London (#RUL12AoC), and University of Brighton (#12brightapps) for the engaging activities, clear instructions, and great ideas around how to use mobile apps to personalize and energize learning and make teaching more interesting. I did some further reading about the 12 apps of Christmas workshop and found that six UK institutions participated (see The six 12 apps of Christmas spreadsheet – http://bit.ly/1Zhy5cp.) While Brighton and Regents used the same basic structure (established by Regent'sU in 2014?) The Dublin Institute of Technology got more creative. Each institution selected 12 apps (lots of variety although there was soe overlap) and provided short tasks (to encourage you to explore the potential uses of each app) as well as hosting discussions (on web boards and through Twitter) on potential pedagogical issues and uses. The value for me was primarily due to their focus on the educational value of each app but I also found the variety of tasks, explanations and approaches to each day very inspiring. e.g., Try to think up ways that iMovie (or Video Maker Pro Free) could work for you in your classrooms and lecture theatres? How would you use it? Recording student-presentations? Oral-Exams? Short video demonstrations that you can use to “Flip” your classroom? I thought Regent's University did a good job of providing a clear, comprehensive and consistent presentation each day and I found they had the best selection of Useful Resources. I've got hours of additional exploration and some potentially really useful ideas from these sections. My favourite Regent's app was WhatsApp – lots more exploring to do with that app! I appreciated the effort that University of Brighton's team put into offering separate tasks and apps for participants from outside their institution (and outside of the UK). Thanks to all of you for being so inclusive. I also appreciated the many embedded, annotated illustrations and the thorough explanations of the tasks for each app. My favourite UofBrighton app was ExplainEverything. It was pretty much a tie between Regent's and Brighton as to who posted the sickest (funniest?) jokes. I've been regaling friends and colleagues with them (inflicting?) since this started. Thanks for the smiles (and chuckles) you generated – laughter may be the best medicine but it also keeps learners engaged (at least this learner). I found the Dublin Institute of Technology's unwrapping apps icons the most visually appealing and their zoho site was very easy to use and navigate. They broke with the structured approach I described above and focused on personalized learning – using the VARK framework to explore the day's app from the perspective of a Visual Learner, an Auditory Learner, a Read/Write Learner and a Kinesthetic Learner. Although I'm not a big fan of learning styles, in this case the framework provided a structured way to explore different ways of presenting learning – very successfully! I loved Frances Boylan's Soundcloud clips and have shared them with several instructors – hopefully we'll all be more creative in the future. Also loved DIT's selection of apps – some overlap with other institutions but their creativity in exploring different types of learning (using the VARK framework) meant that they certainly provided a really good introduction and overview of the power of personalizing learning! A great 12 days of learning – thanks to everyone who participated. Maybe we'll try a Canadian version next year!